When it comes to days at the beach, everyone has their own preferences. Some people focus on the sand, preferring the softest and whitest beaches to walk along and sunbathe upon, while others focus on the water, looking for big waves to surf or gentle shallow areas in which to paddle with little ones. There are so many different things to do at a beach and so many reasons to visit, it's no surprise that beach-going is one of the oldest pastimes in the world and remains a hugely popular way to spend a sunny day in the modern era. In the United States, many of the best beaches are famously found in Florida. The Sunshine State is known for having the best weather and the longest coastline of any contiguous state, resulting in a myriad of magical beaches on both the Atlantic and Gulf coasts. One of the best places to spend some time at the beach is in the West Palm Beach area, over on the southern part of Florida's east coast. West Palm Beach itself is part of the Miami metropolitan area and houses a little over 100,000 people, but attracts millions more each year due to its sunny skies and postcard-style coastline. West Palm Beach has a lot of breathtaking public beaches to choose from, attracting large crowds of locals and tourists all through the year. Some of the beaches around West Palm Beach are relatively simple and untouched, while others come complete with useful amenities and extra features like playgrounds and parks. If you're planning a beach trip in West Palm Beach and the surrounding area, here are some details and overviews of the very best locations to choose from. Many of the beaches around West Palm Beach are quite touristic and built-up, with lots of nearby hotels and restaurants, but if you're looking for a simpler, more pristine beach experience in the area, John D. Macarthur Beach is a great place to go. The area is relatively untouched, offering splendid sights of natural Floridian beauty in every direction. There aren't any lifeguards here, but swimming can be enjoyed on calm days. Fishing isn't bad here too and there are several nice walking trails along the beachfront. No list of West Palm Beach beaches can be complete without Palm Beach. Well-known and beloved by countless people for its unique beauty and relaxing atmosphere, this family-friendly location provides soft sand, warm water, and plenty of possibilities for wildlife sightings too. The local area is also a lot of fun to explore, with various art exhibits, gardens, and walking trails to be enjoyed just off the beach itself, so you can spend a full day around Palm Beach and always have new things to do and discover. For families in the West Palm Beach area, Lake Worth Beach is one of the top choices. Lifeguards are always on duty here to provide maximum safety for all swimmers, and there's a huge play area for youngsters to enjoy as well. Restrooms and large parking spaces complete the long list of amenities at this West Palm Beach location, and there are several great bars and eateries just a short walk away. Surfers and angling enthusiasts will have fun at this beach as well, so it's a great all-round location for every kind of activity. If you want to visit a West Palm Beach with your furry friend, Juno Beach is the one for you. Unfortunately for man's best friend, many beaches in the area don't allow dogs to enter, but Juno Beach does. It's also a super spot for families and all kinds of beach-goers, with swimming, surfing, fishing and more all enjoyable at this location. There's an extra long pier at Juno Beach too, which can be lovely to walk along at any time of day. Restrooms and picnic tables are found here as well, so you have all the amenities you need for a full day of fun in the sun. 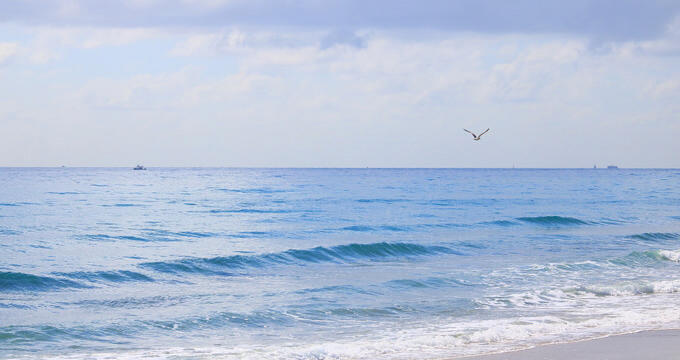 Beloved by locals and adored by any tourists who have ever taken the time to visit it, Delray Beach is one of the best beaches in the West Palm Beach area. The local town is also a lovely spot to spend the day, with a lot of nice shops to explore, a thriving art district, and good quality dining options. There's also a lot of green space in the nearby West Delray Regional Park, which features a large lake and lots of hiking trails. As for the beach itself, visitors will be able to enjoy the typically warm Florida waters and soft sands of this, so it's an ideal location for sunbathing and casual swimming. Located in the little town of Jupiter, Carlin Park is one of the prettiest and most popular beaches around West Palm Beach. It's a large space with a lot to offer, including walking trails and free outdoor exercise equipment, and accessing this beach is very easy too, with lots of ample free parking areas. Several pavilions can be found around the park, along with a play area for kids and the local Seabreeze Amphitheater, which hosts various events and live entertainment shows throughout the year.